We go to Jurong Bird Park quite a bit, since it's close to our house and we have a membership there, making visits more-or-less free. Last time we visited R had a good time doing the usual stuff: running around in the water play park, admiring the strange and interesting birds, and eating popsicles (her favorite treat there, even though they also have ice cream: is she really my child?). 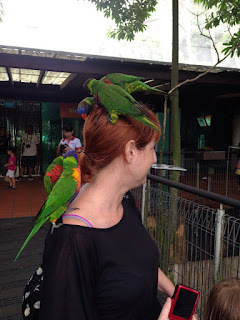 R also took a big step in finally daring to feed the lories, small colorful parrots from Australia. 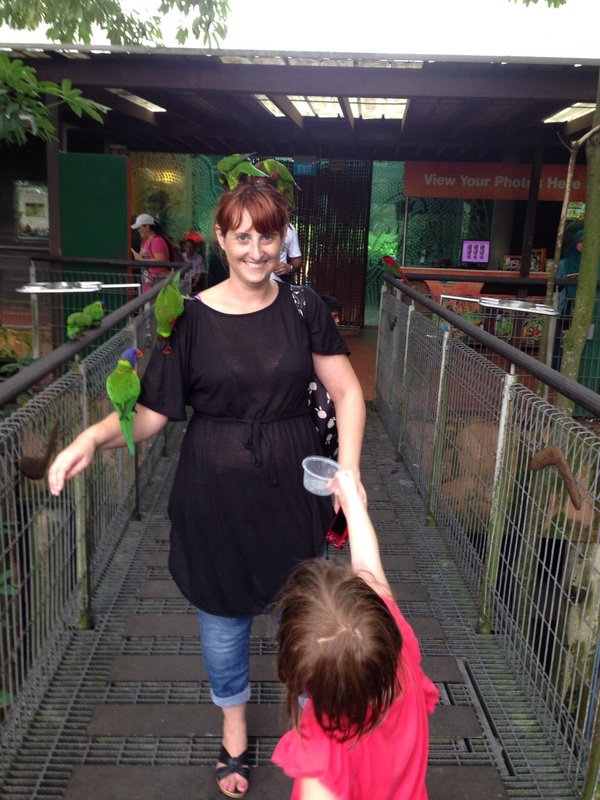 The bird park has a really cool exhibit of them, a 9-story-high enclosed aviary where the birds roam freely. For a minimal fee, you can buy a little cup of white watery mush to feed them, which generally attracts at least a few birds. She has always been too afraid to feed them herself on our previous trips (she is generally quite shy of animals, partly because she doesn't get any exposure to them in everyday life: even pet dogs are not that common here, as compared to the US). I was very pleased with her for being so brave! I fed them too and (luckily, since it would have terrified R) the lories really liked me. At one point I had at least five crawling all over my head and shoulders. They wouldn't even get off when I walked around and I had to literally shake them off. It is really fun to feed them and well worth the few dollars it costs!